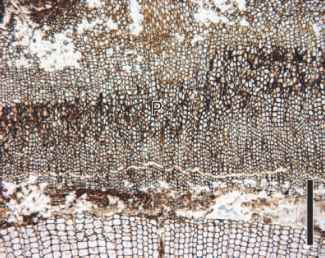 figure 7.13 Transverse section of Lepidodendron stem showing extensive periderm (P) (Pennsylvanian). Bar = 1 mm. contain one cell type and complex tissues, more than one type. Under the system of Sachs (1875), there are three tissue systems: the dermal, vascular, and ground (or fundamental) tissues. Dermal tissue is the outer covering of the plant, consisting of epidermal cells and cuticle in young plants, and periderm (FIG. 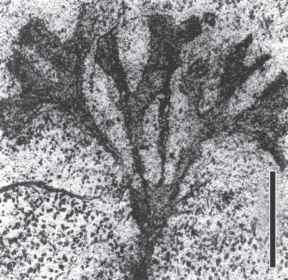 7.13), in plants that produce extensive secondary growth. Vascular tissue is the conducting tissue in the plant and consists of xylem (water conduction) and phloem (food conduction) tissue. Ground tissue is basically everything else in the plant. It can include simple tissues like parenchyma or complex tissues that include parenchyma and other cell types, for example, sclerenchyma.